Discovering Jeff Koons: Now at the Newport Street GalleryUncover Old Street’s secret hide out, inside the Underground Station!Symmetry Breakfast: Cook Love Share – The book launch! The rooftop of John Lewis Oxford Street has been transformed from stuffy department store to garden shrine. The London based store has totally transformed their roof area with an arena of blooms and fresh herbs. There’s food, yoga, pop up shops and so much more. 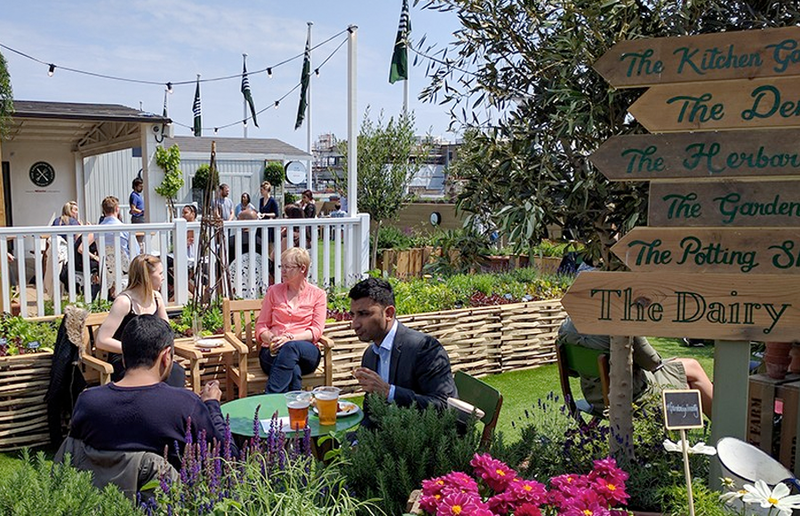 The spot, which is open all summer, is hosting pop-up restaurants in collaboration with Night Tales, a coffee shop, morning activities and a vibrant garden where you can relax and take time out. Designed by renowned gardener Tony Woods – previously awarded RHS National Young Garden Designer of the Year – the rooftop garden makes home to a unique space. Unlike many other London rooftop venues the vibe is totally chilled out, with a laid back atmosphere. Food available is rotated by a selection of different pop ups, and cocktails curated by Background Bars will incorporate herbs grown and freshly picked each day from The Gardening Society’s garden, to match the food on offer. If that wasn’t enough, 20 Etsy makers will be selling their unique products on the rooftop garden over the August Bank Holiday weekend, as well. It’s quickly become a favourite spot especially when shopping in Oxford Street, and John Lewis are really utilising the space – which has been not been over crowded like many other pop ups. It’s a little piece of the countryside in busy Oxford Street… and it’s well worth checking out. The roof garden will be open Thursday to Saturday, noon-11pm, Monday-Wednesday noon-8pm and noon-6pm Sunday.